Chhole Peyaz Pulao is an easy to make recipe in all household. 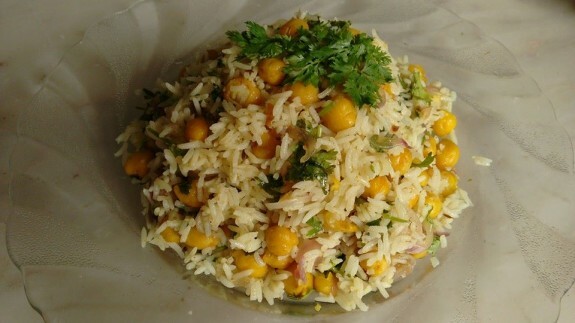 This innovative preparation of pulao infused with chickpeas, chhole masala and golden onion can be served as an accompaniment to any Indian dish. One special dish for any special occasion including Guru Nanak Jayanti, Diwali and more. 1. Heat oil in a pan and add cumin seeds. 2. While the seeds start crackling, add chopped ginger and garlic. Sauté it for a minute. 3. Add onions and sauté till golden brown. Now add the chick peas and mix it well. Stir and cook it for 1 minute. 4. Add salt, Chhole Masala and rice and mix everything well. Cook for a minute. 5. Add 1 tbsp chopped coriander leaves. 6. Your Chhole Pulao is ready. Serve hot. I am a hotelier to the..